McDonald S, Wall J, Forbes K, Kingston D, Kehler H, Vekved M, Tough S. Development of a prenatal psychosocial screening tool for post-partum depression and anxiety. Paediatric and Perinatal Epidemiology 2012; 26: 316–327. Background: Post-partum depression (PPD) is the most common complication of pregnancy in developed countries, affecting 10–15% of new mothers. There has been a shift in thinking less in terms of PPD per se to a broader consideration of poor mental health, including anxiety after giving birth. Some risk factors for poor mental health in the post-partum period can be identified prenatally; however prenatal screening tools developed to date have had poor sensitivity and specificity. The objective of this study was to develop a screening tool that identifies women at risk of distress, operationalized by elevated symptoms of depression and anxiety in the post-partum period using information collected in the prenatal period. Methods: Using data from the All Our Babies Study, a prospective cohort study of pregnant women living in Calgary, Alberta (N = 1578), we developed an integer scorebased prediction rule for the prevalence of PPD, as defined as scoring 10 or higher on the Edinburgh Postnatal Depression Scale (EPDS) at 4-months postpartum. Results: The best fit model included known risk factors for PPD: depression and stress in late pregnancy, history of abuse, and poor relationship quality with partner. Comparison of the screening tool with the EPDS in late pregnancy showed that our tool had significantly better performance for sensitivity. Further validation of our tool was seen in its utility for identifying elevated symptoms of postpartum anxiety. Conclusion: This research heeds the call for further development and validation work using psychosocial factors identified prenatally for identifying poor mental health in the post-partum period. 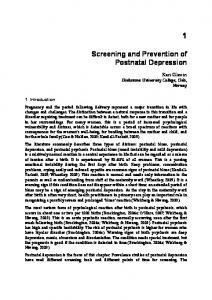 Keywords: screening, psychosocial, prenatal, post-partum depression, post-partum anxiety. predicting self-reported anxiety symptomatology, another indicator of distress in the post-partum period. Variable selection for inclusion in the prenatal screening tool was based on established risk factors for PPD as identified in the literature,19,23,32 factors measured during pregnancy in the present study, and feasibility/utility issues. The latter consideration was deemed important given that the tool’s ultimate purpose would be implementation during routine prenatal visits. Report "Development of a Prenatal Psychosocial Screening Tool for Post-Partum Depression and Anxietyppe_"